Chancellor Patrick Gallagher opened his report at the University Senate Council meeting Wednesday by addressing the killing of Pitt student Alina Sheykhet. This was the chancellor’s first public statement regarding the tragic death. “Our community was heartbroken at the loss of Alina Sheykhet … this kind of violence is so senseless,” he said. Sheykhet was found dead in her home on Cable Place Sunday, Oct. 8. Matthew Darby, Sheykhet’s ex-boyfriend whom she had filed a protection-from-abuse order against, was charged with homicide Tuesday, Oct. 10, and was arrested two days later in South Carolina. Gallagher encouraged students and faculty to use the University’s many mental health resources and to reach out for help if needed. The conversation then turned to the budget crisis in Harrisburg, where it stayed for the majority of the council meeting. 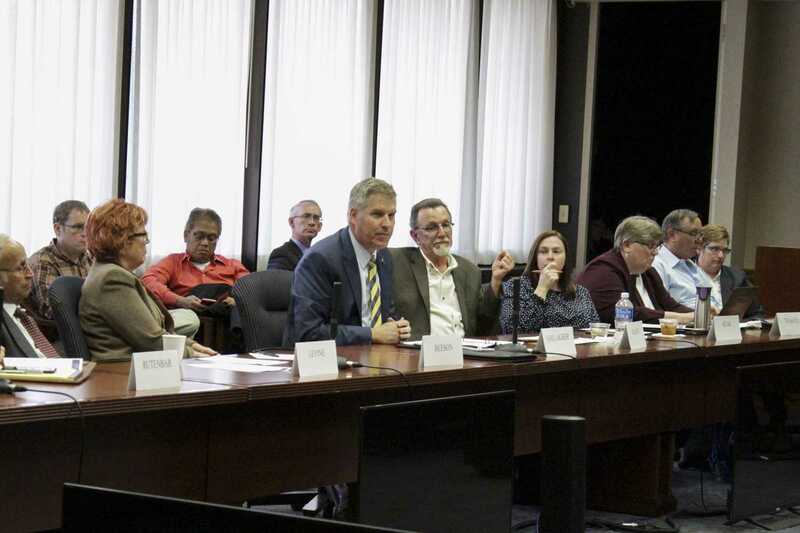 Gallagher and other faculty expressed their concern about the partisan politics that are jamming up the revenue and appropriation bills in Harrisburg. Pennsylvania House republicans passed a revenue package last night that would increase the amount the state would borrow to $1.5 billion, according to an article in the Pittsburgh Post-Gazette. The package includes revenue from expanded gambling and requiring online retailers to collect Pennsylvania’s six percent sales tax in addition to transfers from state funds. Even if Gov. Tom Wolf and the state senate approve the bill, funding for state-related universities would remain uncertain. This is because an appropriation bill for these schools would still need to be passed, which would not be easy considering the proposed increase in the amount the state is borrowing as it faces a $2 billion deficit. Gov. Wolf met with Gallagher last Thursday to “reassure him of his commitment to the state-related universities,” Wolf’s press secretary J.J. Abbott said in an email. But Gallagher said at the council meeting he is still unsure whether state-related funding will be passed. A lack of state-related funding could ultimately impact students. University spokesperson Joe Miksch confirmed last Wednesday Gallagher is considering a mid-year tuition increase if it comes to that point. The chancellor said all members of the Pitt community are needed to pressure lawmakers to ensure state-related appropriation bills make it through the Pennsylvania state legislature. “[There is a concern] felt by many that if this failure to fund these universities happens, we could very easily be in a permanently defunded situation,” Gallagher said. The bills that fund Pitt and other Pennsylvania associate schools are passed after the rest of the state budget and require a two-thirds majority to pass. This means the legislation can be easily used as a political tool, Gallagher said. Although many students are concerned, representatives are responding to the pressure. Student Government Board has been encouraging students to call and email their representatives. Gallagher explained that Harrisburg representatives were unable to read their emails as they have received around 35,000. SGB has also been working to ensure that students are aware of the situation and are actively engaged with their state representatives. SGB representatives hosted a phone-banking event last Wednesday, Thursday and Friday, offering a slice of pizza to anyone who called state representatives to voice their opinion. Carey Balaban, a professor in the Department of Otolaryngology and senate council member, said students should keep the pressure on Harrisburg. “We are united and working to see that there are no cuts … we have a strong resolve and I think that there wasn’t a dissenting voice around the table,” he said. Aside from student involvement, Rob Rutenbar, senior vice chancellor for research and senate council member, said everyone in leadership positions — faculty, the board of trustees and alumni — is being enlisted to message the commonwealth. “The entire point of the conversation here is to convince the state of the extraordinary value proposition that Pitt provides,” Rutenbar said. Zuri Kent-Smith, a junior Africana studies major and SGB executive vice president, sat in place of SGB President Max Kneis, who was unable to attend the meeting, Wednesday afternoon. Kent-Smith said after the meeting that having an in-state tuition option is important because it helps to remove some financial barriers for students. “Allowing in-state students to be able to have a lower price tag [for tuition] increases the diversity that we see [at Pitt] and the quality of students that we have,” Kent-Smith said.